The physical education program at SPCC provides students with the chance to develop as a whole person through physical and cognitive learning activities, while giving them the tools to create a healthy and physically active lifestyle. The emphasis is on exposing students to different sports and types of exercise so that they may develop proficiency in physical activities for fun, self-expression, challenge, fitness, and social interaction. Most importantly, teaching and modeling cooperation and good sportsmanship are at the core of the program. Major goals of the Physical Education program, which follows the Young World curriculum, include learning skills necessary for various physical activities, becoming physically fit, participating in regular physical activity, understanding the benefits of regular exercise, and valuing physical activity as a part of healthful living. The mission of the school is referred to when planning the physical education program, which reflects the values and the teaching of the Gospel. The purpose of physical education is to provide students with the opportunity to participate in physical activities to the best of their ability. Not only are the skills and strategies of each specific activity taught, but so are self-confidence and teamwork. In this way, students can further the talents that they possess in an environment that encourages them to treat one another, and themselves, with equality and respect. The Physical Education program is designed to benefit all students. 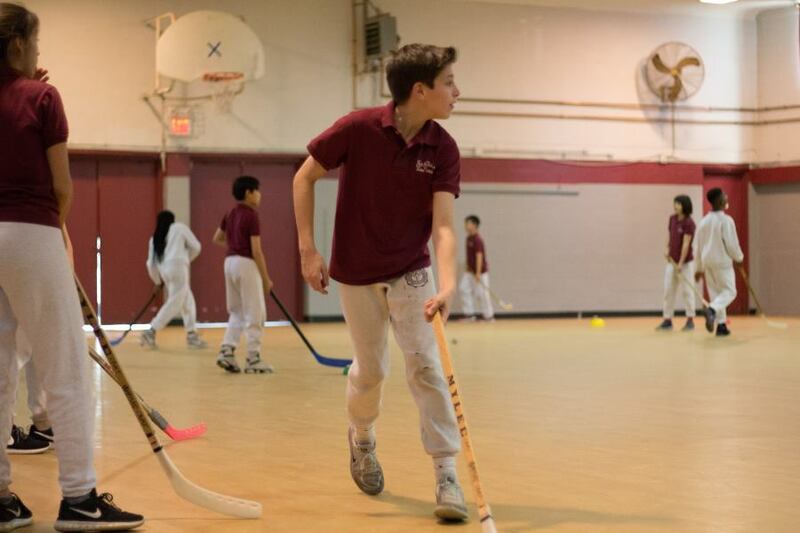 Through their active participation, students will learn to incorporate physical activity in their daily lives while developing knowledge, skills, and social, as well as spiritual, growth – all important qualities necessary to become “holistically” educated individuals in an ever-changing society. Developmental considerations are taken into account by recognizing the various athletic abilities of each student and providing age-appropriate activities. For instance, the focus for students in grades PK-3 is on the development of gross motor skills including running, hopping, skipping, jumping, and ball skills, and rhythm through dance and other activities. Most importantly, cooperation and team play are at the core of each class. For upper elementary and middle school students, other sports skills and rules are taught explicitly and practiced. By providing coeducational classes with an atmosphere of respect for students of all backgrounds and abilities, and a flexible curriculum that adapts to the individual needs of each student, gender, diversity, and multicultural issues are addressed in the physical education program. Students are assessed by a rubric grade for their participation, effort, attitude, and level of ability throughout the course of the year. Students’ interest and performance in different activities enable the teacher to make modifications to the curriculum. Strengths of the physical education program include the teacher’s differentiation of the curriculum to meet the needs and abilities of individual students, as well as the Christian atmosphere it provides to support students in their physical, social, and spiritual growth.